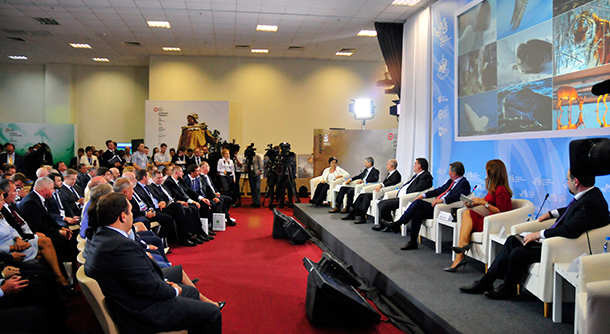 Russia has gathered its greatest influencers in business and government this week in Vladivostok to promote the development of the Eastern Russia economy and expand international cooperation in the Asia-Pacific region. On a request from Rinat Gizatulin, Deputy Minister of Natural Resources and Environment, I spoke at the Eastern Economic Forum’s “Business and Biodiversity” panel yesterday, which was broadcast live on television. Among the billionaires in standing-room-only attendance were Victor Wekselberg, Oleg Budargin, Kiril Dmitriev, Sergei Frank, Andrei Kostin, Dmitrii Patrushev, Vadim Shvecov, as well as celebrity actress Pamela Anderson who has had a whirlwind tour of the area in the past couple of days to the delight of international media. Panelists included Minister Sergey Donskoy; Mr. Konstantin Chuichenko, advisor to President Vladimir Putin; Sergei Kirienko, ex-prime minister of Russia and now head of the Nuclear Agency: Rosatom; and Mr. Kostin, president of VTB bank and commercial director of Sakhalin-2. I was the only NGO representative. Sergey Ivanov, Chief of Presidential Administration and host of the panel, spoke about his love of Amur leopards before Mr. Chuichenko spoke about President Putin’s commitment to tigers. Sergey Kirienko shared a surprising story on how they protect animals. His company is involved in mining in Tanzania. When his company found out that the roads they were building were being used by elephant poachers, they established anti-poaching brigades and equipped them with all modern equipment, including drones. Finally, everyone turned to me for my perspective on what could motivate business to protect biodiversity. I said big mammals like elephants, tigers, and whales are celebrities. If your company has a logo with a tiger, it is quite natural for you to help tigers, just like Asia Tigers is helping IFAW to protect tigers in Russia. I spoke about the example of the Global Tiger Initiative of the World Bank, which brought together leaders from government, civil society and business, and its summit in St. Petersburg. After the panel, IFAW brochures were distributed to the attendees and met with bona fide interest. Later, there was an auction to raise funds for biodiversity in Russia. The pièce de résistance: a buoy from the internationally popular Baywatch series. Bidding started at RUR 250,000 and it sold for RUR 3,000,000 ($44,000 USD)! After the auction I had the pleasure to chat with Anderson and discuss seals and sealing (about which she is very outspoken) and whale conservation in Russia. It is nice to know we share similar viewpoints. IFAW is no stranger to Vladivostok, the main city of the Russian Far East Primorie area, which is high in biodiversity: whales, belugas, dolphins and seals in the sea and tigers, leopards and bears on the land. IFAW has been part of an historic tiger project in that area to rescue and protect Amur tigers for nearly fifteen years now. We support an anti-poaching brigade, run a public awareness campaign through a very popular Tiger Day and have helped to rehabilitate and release six orphan tiger cubs. It is an honor to share these accomplishments of our work in a forum of such high-powered individuals, who show a genuine interest in furthering biodiversity.